The WMEM1036 series of medical AC/DC wall mount power supplies provides up to 36 Watts of continuous output power in a 3.92” x 1.79” x 1.22” package. 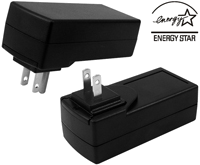 This series consists of single output models with a wide input voltage range of 100~240VAC. The WMEM1036 series is RoHS, WEEE, and CEC/Energy Star Level V compliant and has UL60601-1 medical approvals. These models are also protected against over voltage and short circuit conditions. 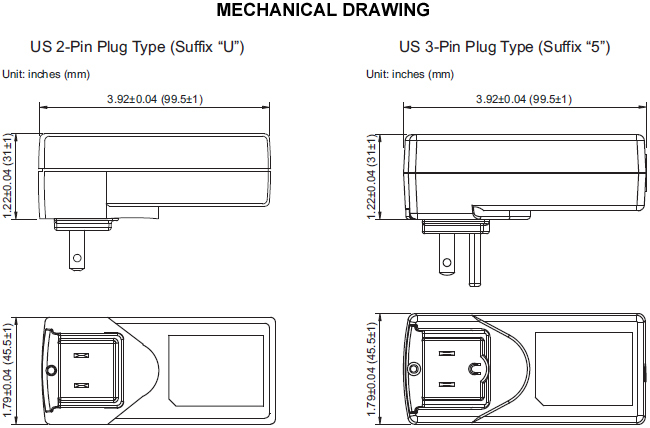 US 2-Pin (suffix “U”) and US 3-Pin (suffix “5”) plug types are available. Please call factory for ordering details. 2. The output voltage is specified as a range (Ex: 9~15VDC); the customer must specify what they want the voltage set at. 3. Optional output connectors are available. Please call factory for ordering details.